Finding the right waiting room chairs or reception seating arrangements for any office building can be difficult. One must consider how many chairs or seats are needed, what style best fits the overall theme and color scheme of the office, and what price point they are willing to spend. Reception seating can make a world of difference when it comes to the overall success of the business at hand and the comfort of the clients that are waiting. 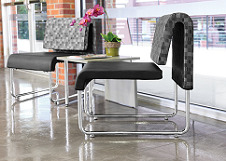 Reception seating can offer a place to rest and wait, a place for visitors to become familiar with the business in question, and a place to welcome those customers that are visiting your office building. Waiting room chairs should be easy to clean, have streamlined style that is easy to design around and that works with most concepts, and should be durable. Durability is perhaps the biggest issue to contend with. Office buildings do not want to have to purchase new furniture every year so buying pieces that are beautiful and sturdy is key. Pieces that are made of high quality materials, that have both visual and comfort appeal, and those pieces that can work well with frequent design changes are optimal. Though it may be difficult to find a product that is perfect each and every time, it is far better to buy one set of waiting room chairs than being faced with the need to buy several each year. Finding pieces that are universal, well built, and that can stand the test of time is the best way to outfit any reception area. Contact us to place your reception seating order or to learn more about our waiting room chairs, lobby benches or reception furniture today.